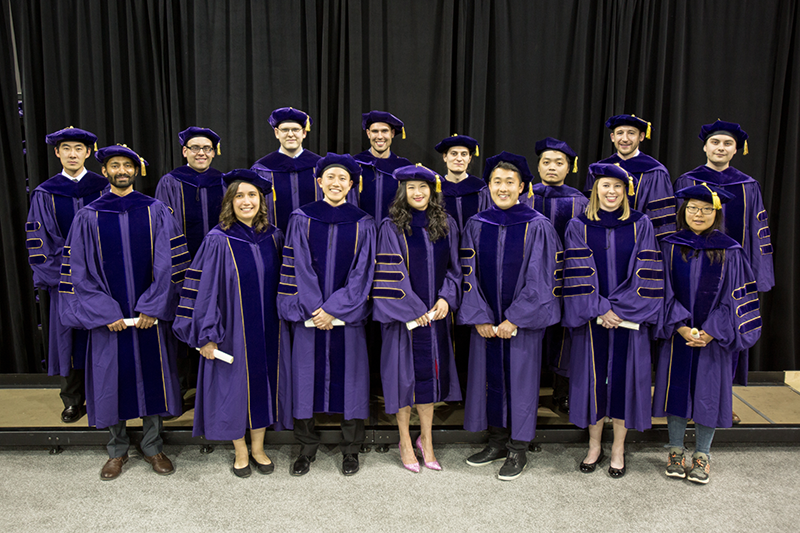 Tonight marked a special milestone in the history of Computer Science & Engineering at the University of Washington, as we celebrated the first graduating class of the Paul G. Allen School and recognized the students, faculty, alumni, and friends who make the Allen School community great. GeekWire has a complete transcript of Barton’s address, plus a video. Barton’s words set a terrific tone for the evening as we honored outstanding scholars and alumni who epitomize the Allen School’s commitment to educational excellence, service to our community, and generating real-world impact through research and innovation. Each year, we recognize members of the graduating class who demonstrate superior scholarship, leadership potential, and the ability to apply and create new knowledge in the field of computing with Outstanding Senior Awards. In past years, we have awarded one award each to a student in computer science and in computer engineering. This year — as a reflection of how much our program has grown and the quality of our students — we decided to expand the award to two students in each discipline: Pascale Wallace Patterson and Sarah Yu in computer science, and Nick Anderson and Pooja Sethi in computer engineering. Sethi also received the Best Senior Thesis Award, which recognizes the very best in undergraduate research at the Allen School based on originality, quality, and impact. She earned the award for her thesis “Respeak: A Voice-based, Crowd-powered, and Accessible Speech Transcription System,” which she completed working with professor Richard Anderson and Ph.D. student Aditya Vashistha. Again, we opted to break with tradition and recognize two students instead of one: Kuikui Liu also received a Best Thesis Award for “The Method of Interlacing Polynomials,” which he completed working with professors Shayan Oveis Gharan of the Allen School and Rekha Thomas of UW Mathematics. We also recognized Royden Lucky with our Undergraduate Service Award, which is given to a graduating senior who has taken an active role in the Allen School community during his/her time as a student—contributing time, expertise, and enthusiasm to our events and activities. The UW student chapter of the Association for Computing Machinery (ACM) recognized lecturer Adam Blank with its Undergraduate Teaching Award, highlighting his enthusiasm, his responsiveness, and his constant drive to improve the educational experience through innovation. Students themselves also can be powerful teachers — especially those who serve as teaching assistants (TAs). Each year we recognize and thank a small group of particularly outstanding TAs with our Bob Bandes Memorial Award. Our 2017 winners were Francis Ge, Varun Vijay Mahadevan, Alexander Tsun, Pascale Wallace Patterson, and Michelle Yun, with honorable mention going to Justin Huang and Evan McCarty. Our new graduates are joining a long line of leaders and innovators who are using their UW education to change the world. To highlight this fact and recognize our most accomplished alumni, each year we announce two winners of our Alumni Achievement Award. This year’s honorees were A.J. Bernheim Brush (Ph.D., ’02) and Hakim Weatherspoon (B.S., ’99). Brush is a leader in computer-supported collaborative work. After spending 11 years leading a variety of influential projects in Microsoft Research, she is now part of the Cortana product group working on far-field speech interaction, natural language processing, and user interface design for the company’s in-home digital personal assistant. Weatherspoon combined Computer Engineering with varsity football at UW, traveling to four bowl games as a Husky. 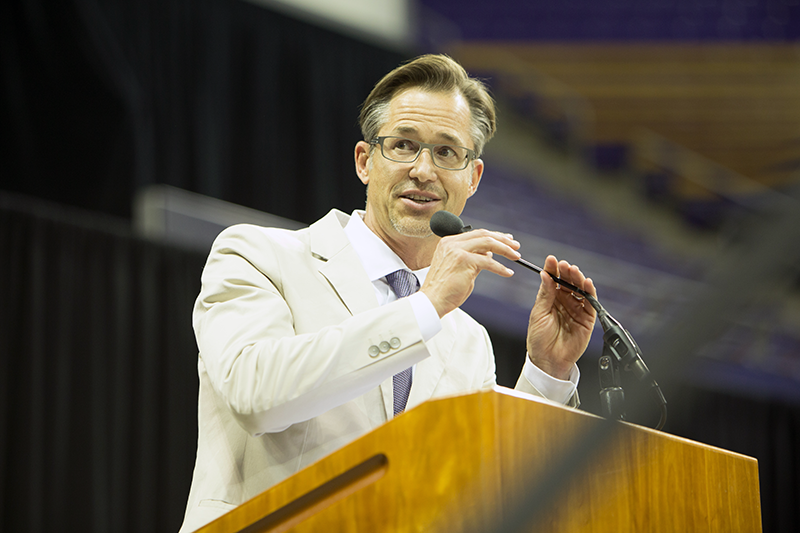 He followed his UW education with a Ph.D. from the University of California, Berkeley and has spent the past nine years as a professor at Cornell University. He is internationally renowned for his work on web-scale distributed systems and has earned accolades for his commitment to promoting diversity in computing. Read more about Brush and Weatherspoon in our newsletter article here. Check out the complete graduation program here. And see GeekWire’s video of the entire ceremony here. Congratulations to all of our graduates, and thanks to everyone who made our first Allen School graduation such a special occasion!